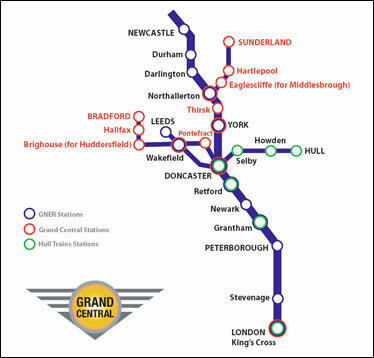 Grand Central is a privately owned, open access train operating company that connects London to North Yorkshire and the Durham Coastline. Grand Central services run along part of the East Coast mainline.The company began operations in 2007. Grand Central Trains' North Eastern service calls at six stations: London Kings Cross, York, Thirsk, Northallerton, Eaglescliffe and Hartlepool rail station. The quickest total journey time 3 h 22. Grand Central's West Riding Service is now in operation and provides daily services between Bradford Interchange, Halifax, Brighouse, Wakefield, Pontefract, Doncaster and London Kings Cross railway station. Grand Central has put forward a proposal to introduce a new North West line that will provide direct services between London and Blackpool in 2012. On top of serving the Fylde peninsula, the North West service will also benefit the South Cheshire & Trent Valley regions calling at: Poulton-Fylde, Kirkham & Wesham, Preston, Hartford, Tamworth & Nuneaton station. Grand Central standard class passengers enjoy more room on board than if they were travelling with most other train operators, furthermore passengers travelling to and from London are entitled to a free tea & coffee*; simply take your standard class ticket to the buffet car which is located in the centre of the train. Grand Central first class passengers can enjoy larger reclining seats, a complimentary newspaper, at-seat refreshments* and even a complimentary light breakfast* if you are travelling before 11am to and from London. Both first class AND standard class passenger may enjoy free wifi when they travel with Grand Central, power sockets may be located throughout the carriages.